The weather is definitely cooler in the past few days – in this post, I’ve highlighted a warming herb. Easy to incorporate into your diet – ginger teas and gingers chews are probably life’s simple pleasures. Zingiber officinale or Ginger is a tropical plant that is commonly used in most kitchens. 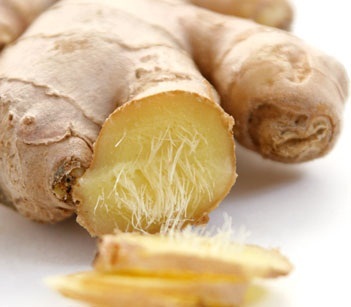 The pungent taste of ginger offers our recipes a unique flavor. Ginger is commonly thought of as a warming herb – it is perfect to add into your diet in the winter. As the weather gets colder – many people suffer from colds and flus. In Chinese medicine this is often referred to as ‘invading cold’ or ‘invading damp’ – which basically means that your body has been overcome by the cold weather. Ginger is one of many herbs that can help in such a situation and it is a wonderful antioxidant. In Asian cultures, Ginger is often used to treat stomach aches, nausea and diarrhea. Ginger can alleviate nausea caused by motion, chemotherapy, and pregnancy. Short term use of ginger can safely relieve pregnancy-related nausea and vomiting. Using 1 gram daily of ginger for up to 4 days is safe and effective for relieving nausea and vomiting in pregnant women. Studies suggest that ginger effectively reduces the severity and duration of nausea during chemotherapy. Ginger is also used in inflammatory conditions such as arthritis and ulcerative colitis. Taking ginger extract twice a day can help reduce pain in patients with osteoarthritis. Common forms of ginger include fresh or dried root, tablets, capsules, liquid extracts (tinctures) and teas. There are few side effects linked to ginger when taken in small doses. Gas, bloating, heartburn and nausea are the most often reported side effect and these side effects are most commonly associated with powdered ginger. A study published in the Journal of Alternative and Complementary medicine compared the efficacy of ginger, ibuprofen and mefenamic acid. Study participants were divided into three groups. Group one took 250 mg of ginger rhizome four times a day on days 1-3 of their menstrual cycle. Group two took 250 mg of mefenamic acid four times a day on days 1-3. Group 3 took 400 mg of ibuprofen four times a day on days 1-3. Assessment was preformed after one menstrual period and the results found that the severity of dysmenorrhea, painful menstrual period, decreased in all groups but no significant differences were found between the groups in pain severity, pain relief or satisfaction. This study is an excellent example of how a natural substance can be just as effective as a pharmacological drug. Why subject your body to the side effects of a manufactured drug when you can get the same results from taking a wonderful herb? This is a wonderful exfoliate and can help soften dull or flaky skin. With the holiday season approaching, we all want our skin to look its best. Enjoy this simple non-toxic body scrub, benefit from the smell, the sensation and allow it to travel with you throughout the day. Mix all ingredients together and then gently rub over your damp skin to slough off dry skin. Do not use this body scrub on your face, as our facial skin is delicate. Rinse with warm water.